Forms and dialogs can augment PowerShell scripts or even resurface them completely to make them more friendly for people who aren’t familiar with the command line. In some cases, a form can even function as a complete script in and of itself. The Get-GuiDate script, which you can download here, developed from a prototype written with PrimalForms, is an example of a script that is completely centered around a control (the Windows.Forms.MonthCalendar control) embedded in a Windows Form. An easily-accessible calendar is a handy tool; unfortunately, Windows never has provided such a tool. 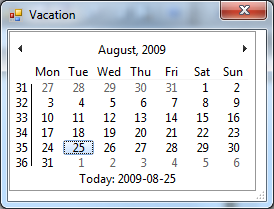 (In fact, prior to Vista, you couldn’t even look at the calendar popup from the systray unless you had administrative privileges – and if you did have sufficient privileges, looking at a date would automatically change the system date). 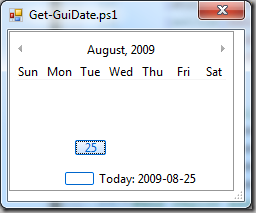 Get-GuiDate started out as a simple calendar that you can quickly call up from PowerShell. This is nothing new, of course. 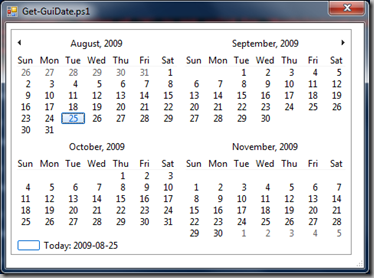 MoW, also known as The PowerShell Guy, wrote a small console calendar script reminiscent of the Unix cal utility for Microsoft’s 2008 Scripting Games. MoW also wrote and blogged about one of the first wrappers for the MonthCalendar control. 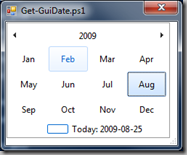 The Microsoft Scripting Guys wrote yet another wrapper and discussed its implementation in intimate detail in a 2008 PowerShell Tip of the Week about Creating a Graphical Date Picker. 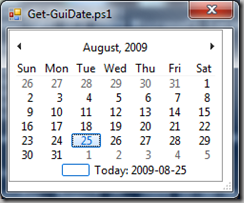 Finally – but neither last nor least – Roman Kuzmin wrote and blogged about a Get-Calendar.ps1 script that displays a calendar and returns a date or range of dates. 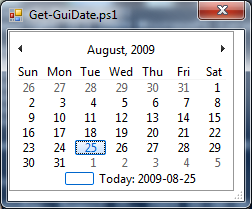 Although we weren’t aware of Roman’s script until after we wrote Get-GuiDate, Get-Calendar.ps1 is a philosophical precursor of Get-GuiDate. Roman used the same concept we did: make a script flexible so it can be used in other ways (multiple months, displaying week number), and return one or more dates so the script can generate data used elsewhere in PowerShell. 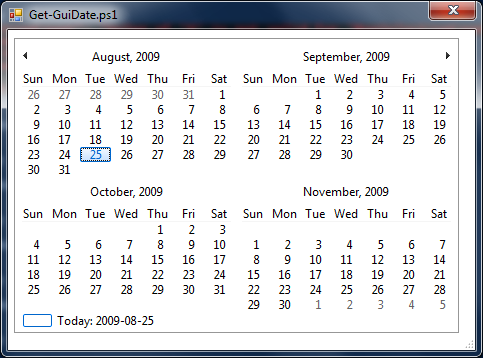 If you run Get-GuiDate without any arguments, it will show the current month, similar to the screenshot shown at right. Note that today’s date will be pre-selected. Today will also be circled and will be shown with the “Today:” legend at the bottom of the form. 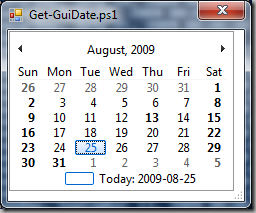 The script name will be shown in the title bar, and the name of the month and year will be a caption at the top, like the August, 2009 here. You can scroll to prior or future months using the side-pointing arrows (t u) at the top of the form on either side of the month caption. You can also select multiple days, as shown here, if you either click and drag over a range, or click on a date and then shift-click on another date. (If one end of the range is the first or the last day currently displayed, or belongs to another month, the calendar automatically scrolls to display the adjoining month). 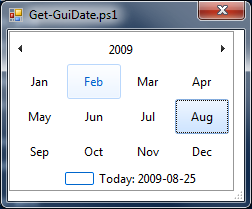 If you either close the form or strike the Enter key, Get-GuiDate returns the selected date; if more than one date was selected, the script transforms the range into an array of dates and returns that. Striking the Escape key is equivalent to cancelling, and returns no dates, whether any were selected or not. 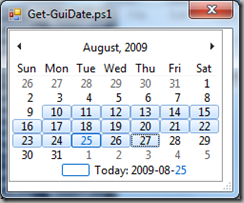 The Calendar control allows you to specify dates that will appear in bold on the calendar. Those can be literal dates to make bold (using the Bold parameter); dates that should be bold each year (using the YBold parameter); and dates that should be bold each month (using the MBold parameter). Here’s a quick example of how we might do this. Let’s say that we have the following special dates to mark. We want Western weekend days (Saturdays and Sundays) bolded for the entire current year; August 31 of every year bolded; and the 15th of every month bolded. As you can see, all of the weekend days are bold (including ones in adjacent months); August 31 is bold; and the 13th is bold. 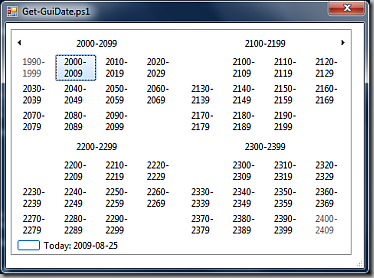 If you need more than a single annual or monthly bolded date, you can give YBold and MBold arrays of dates as well. By default, the calendar control starts up with the local date preselected. 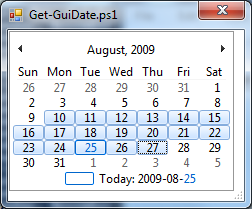 This date is also shown at the bottom of the Calendar control preceded by a colored outline and the text “Today:”. 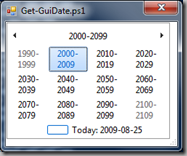 You can control the date selected at startup with the DateSelected parameter, and you can control the date referred to as “Today” with the Today parameter. What this should tell you is that Today doesn’t really mean Today; it means “some date that we’re pretending is today and we want to make easily accessible”. The “true” today is pre-selected, but the Calendar is calling January 1, 2525 Today. The practical effect is that from any date on the calendar, you can quickly jump to 2525-01-01 by clicking on the Today value. So Today serves as an anchor if you need to work with dates surrounding some day other than the current date. There are a few remaining ways you can tweak your calendar’s appearance. We can choose the weekday that each calendar week begins on with the FirstDayofWeek parameter. We can change the title bar text with the Title parameter. The WeekNumbers switch will turn on display of the numeric week of the year at the beginning of each week. Finally, the NoTodayCircle parameter will turn off automatic circling of “Today” on the calendar. One very important point to remember if you’ve worked with the DateTime object’s DayOfWeek property: the FirstDayOfWeek used by the Calendar control can be specified as a number in the range 0-6, just like the DateTime’s DayOfWeek. However, FirstDayOfWeek uses 0 to represent Monday, whereas the DateTime uses 0 to represent Sunday. It’s safest to use the localized string for the day of week you want; this will be parsed into the day of week for you. For flexibility, the only limits on date display and return for your calendar are the ones the Calendar control itself has. This means you can select as large a range of dates as the Calendar control is willing to let you choose (10 years worth) over any date range between January 1, 1752 and December 31, 9998. 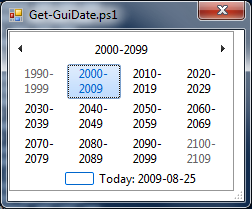 You can choose to limit these values with some of Get-GuiDate’s parameters. This gives you the calendar shown below, empty except for today and completely unscrollable. 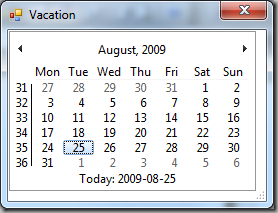 One feature of the calendar control that is only available if visual styles are enabled on your system is calendar zoom. If your calendar control onscreen looks very similar to the screen shots we’ve shown, visual styles are available. If you click on the caption, you can zoom out to get a bird’s eye view of the calendar by clicking the month caption (below left); if you keep clicking on the caption, you can back out until you see an overview of the entire displayable range of calendar dates (below right). Be careful about returning dates after zooming. Whatever zoom level you’re at, selection works at the level of blocks shown on-screen. 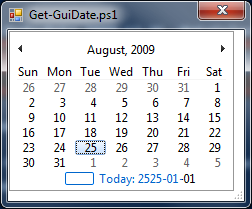 So in the previous picture, if you hit the Enter key or close the dialog, Get-GuiDate will return every single date from the beginning of year 2000 to the end of 2009 – a whopping 3,653 dates! This is about the worst you can do; the MonthCalendar itself will return a maximum of 10 years of dates. If you want to make sure this can’t happen, you can try restricting the size of the selection range using the SelectionCount parameter. Users can still select a larger range of dates, but the control reduces the range to the number of dates specified for SelectionCount, beginning with the first selected date. Windows PowerShell v2: TFM on its way! So first of all, I like this a lot. Very useful. There do appear to be two errors, though, which the script throws if you run it with “Set-PSDebug -strict” The variables $ShowTodayCircle and $Escaped seem to be called without ever being set. Thanks for catching this, tojo! I revised the script today to eliminate the $ShowTodayCircle variable (it was a holdover from revision) and initialize $Escaped prior to use. I’ve also changed the way $FirstDayofWeek is cast to eliminate a problem with Forms library preloading.